Anatomic pathologists and clinical laboratories may gain a tool to identify tumorheterogeneity. This would enable them to ultimately guide personalized cancer therapies if a new method for measuring genetic variability within a tumor and predicting outcomes is confirmed in future studies. The new tool was dubbed “MATH” by researchers at The Ohio State University Comprehensive Cancer Center–Arthur G. James Cancer Hospital and Richard J. Solove Research Institute (OSUCCC–James). MATH is the scoring method they developed and stands for mutant-allele tumor heterogeneity. MATH was used to measure the genetic variability among cancer cells within tumors from 305 patients with head and neck squamous cell carcinoma (HNSCC), treated at multiple institutions, from The Cancer Genome Atlas. In announcing the study results, OSUCCC-James stated that cancers that showed high genetic variability—called “intra-tumor heterogeneity”—correlated with lower patient survival. 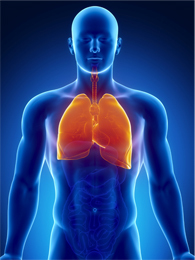 Their findings were published in the February 2015 issue of the journal PLOS Medicine. Medical News Today reported that each 10% increase in MATH score corresponded to an 8.8% increased likelihood of death. Until now, oncologists have been reluctant to use “tumor heterogeneity to guide clinical care decisions or assess disease prognosis because there is no single, easy-to-implement method of doing so in clinical practice,” reported the OSUCCC-James statement. The MATH score, however, overcomes that issue since it can be computed from whole-exome sequencing data obtained from a single formalin-fixed, paraffin-embedded tumor sample. It is pathologists who take tumor tissues and produce formalin-fixed, paraffin-embedded samples in their histology laboratories. Thus, as further clinical studies confirm that the use of the MATH tool can produce useful diagnostic and prognostic information for oncologists, pathologist will be perfectly positioned to add MATH to their menu of pathology services. Beck also discussed the important role large sets of cancer samples have in cancer research and in the development of improved personalized therapies for the disease. He observed that open access to large-scale datasets from large populations of cancer patients is “critically important” for devising computational methods for using cancer heterogeneity in clinical settings during the diagnostic process. “The continuing generation of high-quality, open-access Omics datasets from large populations of cancer patients will be critically important to enable the development of computational methods to translate knowledge of cancer heterogeneity into new diagnostics and improved clinical outcomes for cancer patients,” Beck wrote. While their results must be confirmed in further studies and with other cancers, Rocco’s team believes their scoring method holds great promise as prognostic tool. “These findings suggest that MATH should be considered a biomarker for survival in HNSCC and other tumor types, and raise the possibility that clinicians could use MATH values to decide on the best treatment for individual patients and to choose patients for inclusion in clinical trials,” they wrote in PLOS Medicine. Pathologists, particularly in academic pathology departments, might want to track the ongoing development of MATH and how it could be used in patient care. 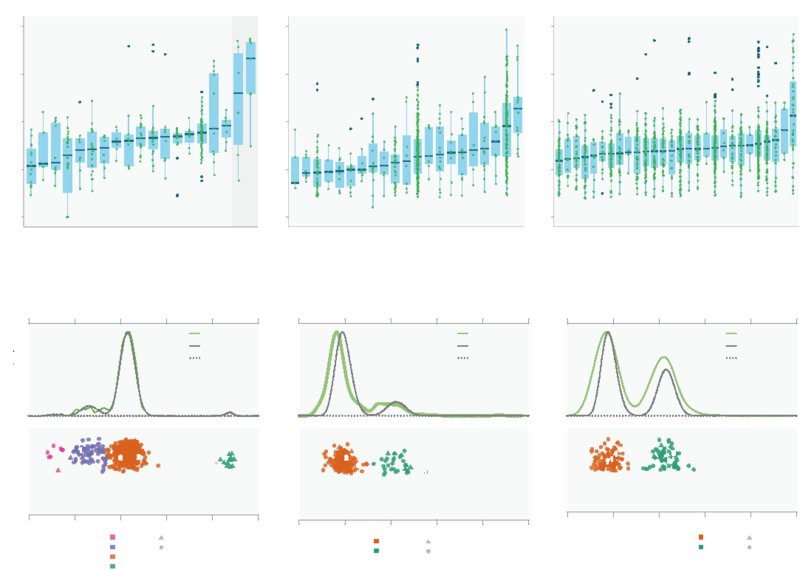 Functional, or systems, analysis of OMICs data aims to identify the pathways and biological processes most affected in the datasets and point out the key genes as potential biomarkers and drug targets. Functional analysis is widely applicable in personalized and translational medicine, drug repositioning, and patient stratification, among many practice areas. Citation: Beck AH (2015) Open Access to Large Scale Datasets Is Needed to Translate Knowledge of Cancer Heterogeneity into Better Patient Outcomes. Cancer is a heterogeneous disease, which is comprised of a collection of diseases traditionally categorized by tissue type of origin. A distinct set of etiologic causes, treatments, and prognoses are associated with different cancers, and even within a given tissue type, cancer shows significant variability in molecular and clinical features across patients. This interpatient heterogeneity is a major rationale for large-scale research efforts (such as The Cancer Genome Atlas [TCGA] and the International Cancer Genome Consortium [ICGC]) to comprehensively profile the molecular landscape of patient cancer samples across all major cancers [1,2]. These efforts have been bolstered by the recent development of new genomic  and computational  technologies to enable increasingly detailed and comprehensive analyses of the molecular landscape of solid cancers. It is hoped that the comprehensive molecular characterization of large sets of cancer samples will lead to the identification of new therapeutic targets and the development of improved personalized therapies for cancer patients. A major challenge in cancer therapy is the development of resistance to molecularly targeted therapies. Although targeted therapies may show initial benefit in the subset of patients carrying a targeted molecular alteration, most patients will nevertheless go on to develop resistance for most advanced solid cancers. Identifying and overcoming drug resistance represents one of the most significant challenges facing cancer researchers today . It is increasingly recognized that cancer is not only a heterogeneous disease across patients but also a heterogeneous disease within individual patients, with different regions of a tumor showing different molecular features at the DNA, RNA, and protein levels [6–9]. This intratumoral molecular heterogeneity is hypothesized to be a major cause of drug resistance and treatment failure in cancer . However, the clinical significance of intratumoral molecular heterogeneity is not yet well-defined, and assessment of intratumoral molecular heterogeneity is not currently used in clinical cancer medicine for assessing disease prognosis or guiding therapy. Two recent research articles published in PLOS Medicine show the potential clinical utility of measuring intratumoral genetic heterogeneity in clinical cancer samples. In one, James Brenton, Florian Markowetz, and colleagues applied the Minimum Event Distance for Intra-tumour Copy-number Comparisons (MEDICC) algorithm they recently developed for phylogenetic quantification of intratumoral genetic heterogeneity from multiregion DNA copy number profiling data  to predict treatment resistance in high-grade serous ovarian cancer . Their analysis suggests that multiregion tumor sampling, DNA copy number profiling, and quantification of intratumoral genetic heterogeneity with the MEDICC algorithm could be a useful approach for predicting patient survival in ovarian cancer, in which higher levels of heterogeneity associated with decreased survival. This study provides data to support the long-standing hypothesis regarding treatment resistance and intratumoral genetic heterogeneity . Although these results are promising, the developed approach requires sampling multiple distinct regions of tumor, which would be more expensive and complex than molecular profiling from a single tissue sample. It is not yet known how much tumor sampling will be required to adequately quantify intratumoral heterogeneity in the clinic or if measuring intratumoral heterogeneity from multiple tumor samples will outperform other molecular approaches (e.g., prognostic expression signatures [13,14]) for predicting response to therapy in ovarian cancer. These are important research questions that will need to be answered prior to clinical translation. The second study comes from James Rocco and colleagues . Previously, these investigators used a publicly available data set of whole exome sequencing data in head and neck squamous cell carcinoma (HNSCC) from Stransky et al. to develop a simple quantitative measure of intratumoral heterogeneity (mutant-allele tumor heterogeneity [MATH]) and showed that MATH scores were higher in poor outcome classes of HNSCC . In the current study, the authors used publicly available whole exome sequencing data provided by TCGA and showed that the MATH score is associated with prognosis in HNSCC and contributes additional prognostic information beyond that provided by traditional clinical and molecular features. Since the MATH score can be computed from whole exome sequencing data obtained from a single tumor sample (which is a data type that can be obtained from formalin-fixed, paraffin-embedded tumor tissue, as is routinely collected in pathology laboratories ), this approach may be more easily translated into clinical use, as compared with approaches requiring multiregion sampling and more complex computational algorithms for the assessment of intratumoral heterogeneity. Nonetheless, establishing the utility of the MATH score as an effective prognostic and/or predictive biomarker in HNSCC will require additional studies of the MATH score on well-controlled clinical cohorts comprised of homogeneously treated patients with tumors at specific head and neck anatomic locations. It is important to note that the development and application of MATH for assessing prognosis in HNSCC was based entirely on the analysis of publically available clinically annotated whole exome sequencing data, which demonstrates the value in making these data open to the community. The continuing generation of high-quality, open-access Omics data sets from large populations of cancer patients will be critically important to enable the development of computational methods to translate knowledge of cancer heterogeneity into new diagnostics and improved clinical outcomes for cancer patients. As one step towards this goal, the DREAM (Dialogue for Reverse Engineering Assessments and Methods) consortium will use open innovation crowd sourcing to identify top-performing computational methods for inferring genetic heterogeneity from next-generation sequencing data provided by a large multi-institutional community of cancer genomics projects, including the ICGC and TCGA . If successful, this open innovation competition may identify a set of best-in-class methods for measuring intratumoral genetic heterogeneity in cancer. In parallel with these advances in computational methods for inferring intratumoral heterogeneity from genomics data, genomics technologies for measuring intratumoral heterogeneity at increasingly fine levels of granularity continue to improve. For example, recent advances in single-cell sequencing of DNA have provided detailed portraits of intratumoral genetic heterogeneity and clonal evolution in cancer [20,21], and recent advances in single-cell RNA sequencing , in situ RNA sequencing [23,24], and highly multiplexed next-generation immunohistochemistry [25–28] enable characterization of intratumoral heterogeneity in gene expression at a single cell level with subcellular resolution. Thus, there are now many options—both molecular and computational—for measuring and analyzing intratumoral molecular heterogeneity from clinical cancer samples. Establishing the clinical utility of these new approaches for measuring intratumoral molecular heterogeneity will require applying these methods to large sets of archival tumor samples from randomized trials of cancer therapeutics  and high-quality prospective observational studies . To maximize the value of the data that would be produced from such an undertaking, it is critical that infrastructure be created and supported to enable sharing of the Omics and clinical data with a large community of cancer researchers and data scientists. Ensuring open access to high-quality datasets will ensure that the largest possible community of researchers is able to address the most important problems in cancer medicine today. And in generating and sharing these data widely, we will massively increase our chances of effectively translating knowledge of intratumoral heterogeneity into meaningful advances for cancer patients. OSUCCC – James researchers Edmund Mroz, PhD, and James Rocco, MD, PhD, developed the MATH method. COLUMBUS, Ohio — A new method for measuring genetic variability within a tumor might one day help doctors identify patients with aggressive cancers that are more likely to resist therapy, according to a study led by researchers now at The Ohio State University Comprehensive Cancer Center – Arthur G. James Cancer Hospital and Richard J. Solove Research Institute (OSUCCC – James). Cancers that showed high genetic variability – called “intra-tumor heterogeneity” – correlated with lower patient survival. If prospective studies verify the findings, MATH scores could help identify the most effective treatment for patients and predict a patient’s prognosis. 9 Jun 2015: The PLOS Medicine Staff (2015) Correction: Intra-tumor Genetic Heterogeneity and Mortality in Head and Neck Cancer: Analysis of Data from The Cancer Genome Atlas. PLoS Med 12(6): e1001844. Although the involvement of intra-tumor genetic heterogeneity in tumor progression, treatment resistance, and metastasis is established, genetic heterogeneity is seldom examined in clinical trials or practice. Many studies of heterogeneity have had prespecified markers for tumor subpopulations, limiting their generalizability, or have involved massive efforts such as separate analysis of hundreds of individual cells, limiting their clinical use. We recently developed a general measure of intra-tumor genetic heterogeneity based on whole-exome sequencing (WES) of bulk tumor DNA, called mutant-allele tumor heterogeneity (MATH). Here, we examine data collected as part of a large, multi-institutional study to validate this measure and determine whether intra-tumor heterogeneity is itself related to mortality. Clinical and WES data were obtained from The Cancer Genome Atlas in October 2013 for 305 patients with head and neck squamous cell carcinoma (HNSCC), from 14 institutions. Initial pathologic diagnoses were between 1992 and 2011 (median, 2008). Median time to death for 131 deceased patients was 14 mo; median follow-up of living patients was 22 mo. Tumor MATH values were calculated from WES results. Despite the multiple head and neck tumor subsites and the variety of treatments, we found in this retrospective analysis a substantial relation of high MATH values to decreased overall survival (Cox proportional hazards analysis: hazard ratio for high/low heterogeneity, 2.2; 95% CI 1.4 to 3.3). This relation of intra-tumor heterogeneity to survival was not due to intra-tumor heterogeneity’s associations with other clinical or molecular characteristics, including age, human papillomavirus status, tumor grade and TP53 mutation, and N classification. MATH improved prognostication over that provided by traditional clinical and molecular characteristics, maintained a significant relation to survival in multivariate analyses, and distinguished outcomes among patients having oral-cavity or laryngeal cancers even when standard disease staging was taken into account. Prospective studies, however, will be required before MATH can be used prognostically in clinical trials or practice. Such studies will need to examine homogeneously treated HNSCC at specific head and neck subsites, and determine the influence of cancer therapy on MATH values. Analysis of MATH and outcome in human-papillomavirus-positive oropharyngeal squamous cell carcinoma is particularly needed. To our knowledge this study is the first to combine data from hundreds of patients, treated at multiple institutions, to document a relation between intra-tumor heterogeneity and overall survival in any type of cancer. We suggest applying the simply calculated MATH metric of heterogeneity to prospective studies of HNSCC and other tumor types. Normally, the cells in human tissues and organs only reproduce (a process called cell division) when new cells are needed for growth or to repair damaged tissues. But sometimes a cell somewhere in the body acquires a genetic change (mutation) that disrupts the control of cell division and allows the cell to grow continuously. As the mutated cell grows and divides, it accumulates additional mutations that allow it to grow even faster and eventually from a lump, or tumor (cancer). Other mutations subsequently allow the tumor to spread around the body (metastasize) and destroy healthy tissues. Tumors can arise anywhere in the body—there are more than 200 different types of cancer—and about one in three people will develop some form of cancer during their lifetime. Many cancers can now be successfully treated, however, and people often survive for years after a diagnosis of cancer before, eventually, dying from another disease. The gradual acquisition of mutations by tumor cells leads to the formation of subpopulations of cells, each carrying a different set of mutations. This “intra-tumor heterogeneity” can produce tumor subclones that grow particularly quickly, that metastasize aggressively, or that are resistant to cancer treatments. Consequently, researchers have hypothesized that high intra-tumor heterogeneity leads to worse clinical outcomes and have suggested that a simple measure of this heterogeneity would be a useful addition to the cancer staging system currently used by clinicians for predicting the likely outcome (prognosis) of patients with cancer. Here, the researchers investigate whether a measure of intra-tumor heterogeneity called “mutant-allele tumor heterogeneity” (MATH) is related to mortality (death) among patients with head and neck squamous cell carcinoma (HNSCC)—cancers that begin in the cells that line the moist surfaces inside the head and neck, such as cancers of the mouth and the larynx (voice box). MATH is based on whole-exome sequencing (WES) of tumor and matched normal DNA. WES uses powerful DNA-sequencing systems to determine the variations of all the coding regions (exons) of the known genes in the human genome (genetic blueprint). The researchers obtained clinical and WES data for 305 patients who were treated in 14 institutions, primarily in the US, after diagnosis of HNSCC from The Cancer Genome Atlas, a catalog established by the US National Institutes of Health to map the key genomic changes in major types and subtypes of cancer. They calculated tumor MATH values for the patients from their WES results and retrospectively analyzed whether there was an association between the MATH values and patient survival. Despite the patients having tumors at various subsites and being given different treatments, every 10% increase in MATH value corresponded to an 8.8% increased risk (hazard) of death. Using a previously defined MATH-value cutoff to distinguish high- from low-heterogeneity tumors, compared to patients with low-heterogeneity tumors, patients with high-heterogeneity tumors were more than twice as likely to die (a hazard ratio of 2.2). Other statistical analyses indicated that MATH provided improved prognostic information compared to that provided by established clinical and molecular characteristics and human papillomavirus (HPV) status (HPV-positive HNSCC at some subsites has a better prognosis than HPV-negative HNSCC). In particular, MATH provided prognostic information beyond that provided by standard disease staging among patients with mouth or laryngeal cancers. By using data from more than 300 patients treated at multiple institutions, these findings validate the use of MATH as a measure of intra-tumor heterogeneity in HNSCC. Moreover, they provide one of the first large-scale demonstrations that intra-tumor heterogeneity is clinically important in the prognosis of any type of cancer. Before the MATH metric can be used in clinical trials or in clinical practice as a prognostic tool, its ability to predict outcomes needs to be tested in prospective studies that examine the relation between MATH and the outcomes of patients with identically treated HNSCC at specific head and neck subsites, that evaluate the use of MATH for prognostication in other tumor types, and that determine the influence of cancer treatments on MATH values. Nevertheless, these findings suggest that MATH should be considered as a biomarker for survival in HNSCC and other tumor types, and raise the possibility that clinicians could use MATH values to decide on the best treatment for individual patients and to choose patients for inclusion in clinical trials. Please access these websites via the online version of this summary athttp://dx.doi.org/10.1371/journal.pmed.1001786. There are two very important criteria which is located in the papers: First these are data from WES sequencing form the TCGA database therefore the method makes an assumption on INTRA tumoral heterogeneity as there the algorithm test cases were based on whole tumor and not compared to temporal or spatial distribution (a simple solution would be to compare the sequencing results from Dr. Sawyers studies with this algorithm). The model also assumes that the distribution of loci mutants predicts the temporal accumulation of mutants during a clonal evolution. Secondly the authors segregate out HPV positive and negative Head and neck cancers and curious why this was the observed case: is this algorithm good at analyzing the clonal evolution of cancers containing indels or just point mutants. Interesting if they do a larger prospective study where they compare their algorithm versus the multi-core biopsy method. The editor is correct is justifying the need for further larger studies, especially for tumors like lung which is hard or dangerous to biopsy. A new study indicates different serotonin-producing brain regions can have opposing effects on emotional behaviors. According to this study, two brain regions in particular, the dorsal raphe nucleus (DRN) and the median raphe nucleus (MRN), appear to have a yin-and-yang relationship when it comes to mood regulation. Specifically, one region’s serotonergic activity can offset the other region’s serotonergic activity. This finding, which emerged from pharmacogenetic research conducted at Columbia University, provides new insights into the development of mood disorders and may aid in designing improved therapies. The study’s details appeared November 19 in Cell Reports, in an article entitled, “Activity of Raphé Serotonergic Neurons Controls Emotional Behaviors.” The article noted that even though serotonin signaling has a well-established role in mood regulation, the causal relationships between serotonergic neuronal activity and behavior remain unclear. In addition, the researchers identified opposing consequences of dorsal versus median raphé serotonergic neuron inhibition on floating behavior. This observation, the researchers surmised, could mean that median raphé hyperactivity increases anxiety, whereas a low dorsal/median raphé serotonergic activity ratio increases depression-like behavior. Despite the well-established role of serotonin signaling in mood regulation, causal relationships between serotonergic neuronal activity and behavior remain poorly understood. Using a pharmacogenetic approach, we find that selectively increasing serotonergic neuronal activity in wild-type mice is anxiogenic and reduces floating in the forced-swim test, whereas inhibition has no effect on the same measures. 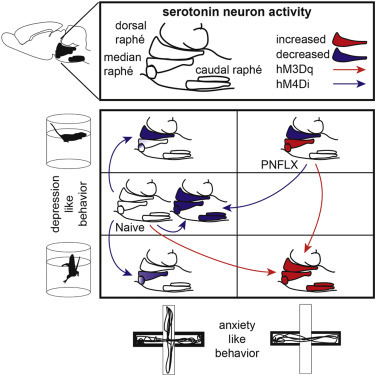 In a developmental mouse model of altered emotional behavior, increased anxiety and depression-like behaviors correlate with reduced dorsal raphé and increased median raphé serotonergic activity. These mice display blunted responses to serotonergic stimulation and behavioral rescues through serotonergic inhibition. Furthermore, we identify opposing consequences of dorsal versus median raphé serotonergic neuron inhibition on floating behavior, together suggesting that median raphé hyperactivity increases anxiety, whereas a low dorsal/median raphé serotonergic activity ratio increases depression-like behavior. Thus, we find a critical role of serotonergic neuronal activity in emotional regulation and uncover opposing roles of median and dorsal raphé function. This is an up-to-date article about the significance of mutations found in 12 major types of cancer. Cyriac Kandoth1*, Michael D. McLellan1*, Fabio Vandin2, Kai Ye1,3, Beifang Niu1, Charles Lu1, et al. 1The Genome Institute, Washington University in St Louis, Missouri 63108, USA. 2Department of Computer Science, Brown University, Providence, Rhode Island 02912, USA. 3Department of Genetics, Washington University in St Louis, Missouri 63108, USA. 4Department of Medicine, Washington University in St Louis, Missouri 63108, USA. 5Siteman Cancer Center, Washington University in St Louis, Missouri 63108, USA. 6Department of Mathematics, Washington University in St Louis, Missouri 63108, USA. Using the integrated data sets, we identified 127 significantly mutated genes from well-knownand emerging cellular processes in cancer. most tumours have two to six, indicating that the number of driver mutations required during oncogenesis is relatively small. histone modifiers are often mutated across several cancer types. investigations of mutations with respect to clonal/subclonal architecture delineate their temporal orders during tumorigenesis. The advancement of DNA sequencing technologies now enables the processing of thousands of tumours of many types for systematic mutation discovery. This expansion of scope, coupled with appreciable progress in algorithms1–5, has led directly to characterization of signifi­cant functional mutations, genes and pathways6–18. Cancer encompasses more than 100 related diseases19, making it crucial to understand the commonalities and differences among various types and subtypes. TCGA was founded to address these needs, and its large data sets are providing unprecedented opportunities for systematic, integrated analysis. We performed a systematic analysis of 3,281 tumours from 12 cancer types to investigate underlying mechanisms of cancer initiation and progression. We describe variable mutation frequencies and contexts and their associations with environmental factors and defects in DNA repair. We identify 127 significantlymutated genes (SMGs) from diverse signalling and enzymatic processes. The finding of a TP53-driven breast, head and neck, and ovarian cancer cluster with a dearth of other mutations in SMGs suggests common therapeutic strategies might be applied for these tumours. We determined interactions among muta­tions and correlated mutations in BAP1, FBXW7 and TP53 with det­rimental phenotypes across several cancer types. The subclonal structure and transcription status of underlying somatic mutations reveal the trajectory of tumour progression in patients with cancer. were included for downstream analyses (Supplementary Table 2). other types have several clusters (for example, 5 and 6 clusters in UCEC and COAD/ READ, respectively) (Fig. 1a and Supplementary Table 3a, b). the cluster with the highest frequency is more than 150 times greater. TP53 mutations are related with higher frequencies in AML, BLCA, BRCA, HNSC, LUAD, LUSC and UCEC (all P < 0.05). Mutations in POLQ and POLE associate with high frequencies in multiple cancer types; POLE association in UCEC is consistent with previous observations14. the largest difference being in C>T transitions and C>G transversions (Fig. 1c). 59% and 67%, substantially higher than the approximately 40% in other cancer types. aberrant DNA methylation in endometrial cancer23 and glioblastoma24. BLCA has a unique signature for C>T transitions compared to the other types (enriched for TC) (Extended Data Fig. 1). transcription factors/regulators, histone modifiers, genome integrity, receptor tyrosine kinase signal­ling, cell cycle, mitogen-activated protein kinases (MAPK) signalling, phosphatidylinositol-3-OH kinase (PI(3)K) signalling, Wnt/ -catenin signalling, histones, ubiquitin-mediatedproteolysis, and splicing (Fig. 2). transcription factor/regulator (Z = 0.40), TGF- signalling (Z = 0.66), and Wnt/ -catenin signalling (Z = 0.55) genes tend to associate with single types (Methods). Notably, 3,053 out of 3,281 total samples (93%) across the Pan-Cancer collection had at least one non-synonymous mutation in at least one SMG. The average number of point mutations and small indels in these genes varies across tumour types, with the highest (,6 mutations per tumour) in UCEC, LUAD and LUSC, and the lowest (,2 mutations per tumour) in AML, BRCA, KIRC and OV. This suggests that the numbers of both cancer-related genes (only 127 identified in this study) and cooperating driver mutations required during oncogenesis are small (most cases only had 2–6) (Fig. 3), although large-scale structural rearrangements were not included in this analysis. The most frequently mutated gene in the Pan-Cancer cohort is TP53 (42% of samples). Its mutations predominate in serous ovarian (95%) and serous endometrial carcinomas (89%) (Fig. 2). TP53 mutations are also associated with basal subtype breast tumours. PIK3CA is the second most commonly mutated gene, occurring frequently (>10%) in most cancer types except OV, KIRC, LUAD and AML. PIK3CA mutations frequented UCEC (52%) and BRCA (33.6%), being speci­fically enriched in luminal subtype tumours. Tumours lacking PIK3CA mutations often had mutations in PIK3R1, with the highest occur­rences in UCEC (31%) and GBM (11%) (Fig. 2). Many cancer types carried mutations in chromatin re-modelling genes. In particular, histone-lysine N-methyltransferase genes (MLL2 (also known as KMT2D), MLL3 (KMT2C) and MLL4 (KMT2B)) clus­ter in bladder, lung and endometrial cancers, whereas the lysine (K)-specific demethylase KDM5C is prevalently mutated in KIRC (7%). Mutations in ARID1A are frequent in BLCA, UCEC, LUAD and LUSC, whereas mutations in ARID5B predominate in UCEC (10%) (Fig. 2). Fig. 1. | Distribution of mutation frequencies across 12 cancer types. 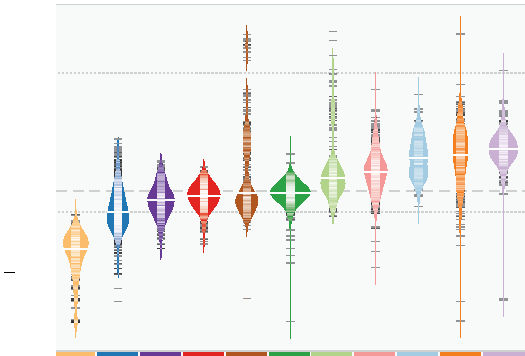 Dashed grey and solid white lines denote average across cancer types and median for each type, respectively. b, Mutation spectrum of six transition (Ti) and transversion (Tv) categories for each cancer type. c, Hierarchically clustered mutation context (defined by the proportion of A, T, C and G nucleotides within ±2bp of variant site) for six mutation categories. Cancer types correspond to colours in a. Colour denotes degree of correlation: yellow (r = 0.75) and red (r = 1). Fig. 3. | Distribution of mutations in 127 SMGs across Pan-Cancer cohort. 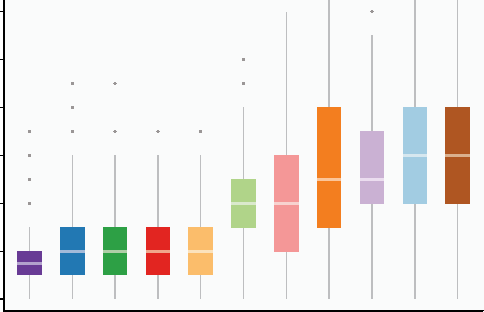 Box plot displays median numbers of non-synonymous mutations, with outliers shown as dots. In total, 3,210 tumours were used for this analysis (hypermutators excluded). Figure 4 | Unsupervised clustering based on mutation status of SMGs. Tumours having no mutation or more than 500 mutations were excluded. A mutation status matrix was constructed for 2,611 tumours. Major clusters of mutations detected in UCEC, COAD, GBM, AML, KIRC, OV and BRCA were highlighted. We examined which genes correlate with survival using the Cox proportional hazards model, first analysing individual cancer types using age and gender as covariates; an average of 2 genes (range: 0–4) with mutation frequency 2% were significant (P<_0.05) in each type (Supplementary Table 10a and Extended Data Fig. 6). KDM6A and ARID1A mutations correlate with better survival in BLCA (P = 0.03, hazard ratio (HR) = 0.36, 95% confidence interval (CI): 0.14–0.92) and UCEC (P = 0.03, HR = 0.11, 95% CI: 0.01–0.84), respectively, but mutations in SETBP1, recently identified with worse prognosis in atypical chronic myeloid leukaemia (aCML)31, have a significant detrimental effect in HNSC (P = 0.006, HR = 3.21, 95% CI: 1.39–7.44). BAP1 strongly correlates with poor survival (P = 0.00079, HR = 2.17, 95% CI: 1.38–3.41) in KIRC. Conversely, BRCA2 muta­tions (P = 0.02, HR = 0.31, 95% CI: 0.12–0.85) associate with better survival in ovarian cancer, consistent with previous reports32,33; BRCA1 mutations showed positive correlation with better survival, but did not reach significance here. To understand the temporal order of somatic events, we analysed the variant allele fraction (VAF) distribution of mutations in SMGs across AML, BRCA and UCEC (Fig. 5a and Supplementary Table 11a) and other tumour types (Extended Data Fig. 7). To minimize the effect of copy number alterations, we focused on mutations in copy neutral segments. Mutations in TP53 have higher VAFs on average in all three cancer types, suggesting early appearance during tumorigenesis. It is worth noting that copy neutral loss of heterozygosity is commonly found in classical tumour suppressors such as TP53, BRCA1, BRCA2 and PTEN, leading to increased VAFs in these genes. In AML, DNMT3A (permutation test P = 0), RUNX1 (P = 0.0003) and SMC3 (P = 0.05) have significantly higher VAFs than average among SMGs (Fig. 5a and Supplementary Table 11b). In breast cancer, AKT1, CBFB, MAP2K4, ARID1A, FOXA1 and PIK3CA have relatively high average VAFs. For endometrial cancer, multiple SMGs (for example, PIK3CA, PIK3R1, PTEN, FOXA2 and ARID1A) have similar median VAFs. Conversely, KRAS and/or NRAS mutations tend to have lower VAFs in all three tumour types (Fig. 5a), suggesting NRAS (for example, P = 0 in AML) and KRAS (for example, P = 0.02 in BRCA) have a progression role in a subset of AML, BRCA and UCEC tumours. For all three cancer types, we clearly observed a shift towards higher expression VAFs in SMGs versus non-SMGs, most apparent in BRCA and UCEC (Extended Data Fig. 8a and Methods). Previous analysis using whole-genome sequencing (WGS) detected subclones in approximately 50% of AML cases15,36,37; however, ana­lysis is difficult using AML exome owing to its relatively few coding mutations. Using 50 AML WGS cases, sciClone (http://github.com/ genome/sciclone) detected DNMT3A mutations in the founding clone for 100% (8 out of 8) of cases and NRAS mutations in the subclone for 75% (3 out of 4) of cases (Extended Data Fig. 8b). Among 304 and 160 of BRCA and UCEC tumours, respectively, with enough coding muta­tions for clustering, 35% BRCA and 44% UCEC tumours contained subclones. Our analysis provides the lower bound for tumour hetero­geneity, because only coding mutations were used for clustering. In BRCA, 95% (62 out of 65) of cases contained PIK3CA mutations in the founding clone, whereas 33% (3 out of 9) of cases had MLL3 muta­tions in the subclone. Similar patterns were found in UCEC tumours, with 96% (65 out of 68) and 95% (62 out of 65) of tumours containing PIK3CA and PTEN mutations, respectively, in the founding clone, and 9% (2 out of22) ofKRAS and 14% (1 out of 7) ofNRAS mutations in the subclone (Extended Data Fig. 8b and Supplementary Table 12). Mutation con­text (-2 to +2 bp) was calculated for each somatic variant in each mutation category, and hierarchical clustering was then performed using the pairwise mutation context correlation across all cancer types. 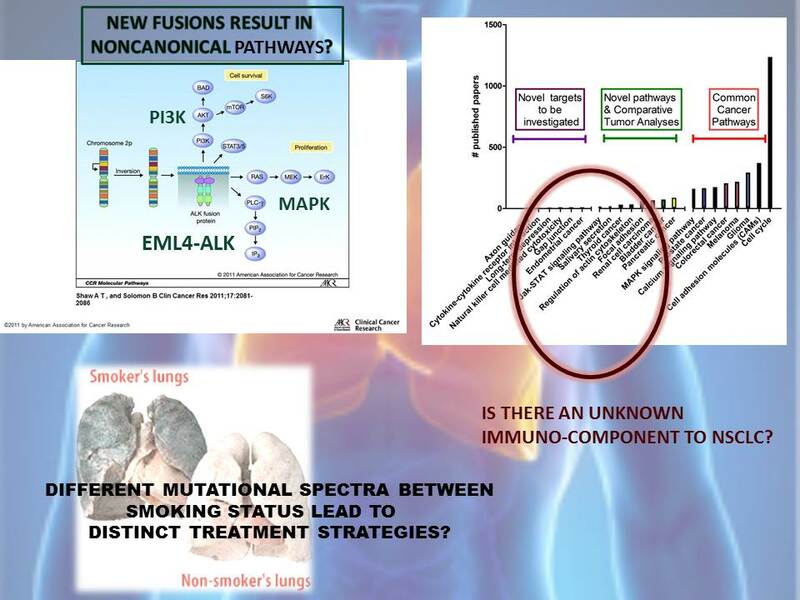 The mutational significance in cancer (MuSiC)3 package was used to identify significant genes for both indi­vidual tumour types and the Pan-Cancer collective. An R function ‘hclust’ was used for complete-linkage hierarchical clustering across mutations and samples, and Dendrix30 was used to identify sets of approximately mutual exclusive muta­tions. Cross-cancer survival analysis was based on the Cox proportional hazards model, as implemented in the R package ‘survival’ (http://cran.r-project.org/web/ packages/survival/), and the sciClone algorithm (http://github.com/genome/sci-clone) generated mutation clusters using point mutations from copy number neutral segments. A complete description of the materials and methods used to generate this data set and its results is provided in the Methods. Dees, N. D. et al. MuSiC: Identifying mutational significance in cancer genomes. Genome Res. 22, 1589–1598 (2012). Roth, A. et al. JointSNVMix: a probabilistic model for accurate detection of somatic mutations in normal/tumour paired next-generation sequencing data. Bioinformatics 28, 907–913 (2012). Cibulskis, K. et al. Sensitive detection of somatic point mutations in impure and heterogeneous cancer samples. Nature Biotechnol. 31, 213–219 (2013). Sjo¨blom, T. etal. The consensuscodingsequences of human breast and colorectal cancers. Science 314, 268–274 (2006). Ding, L. et al. 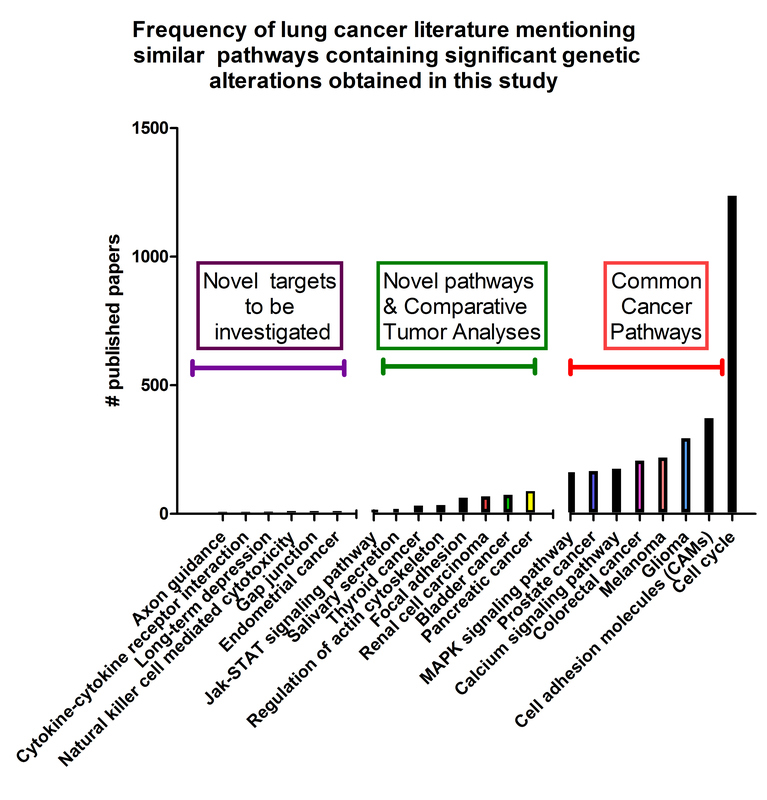 Somatic mutations affect key pathways in lung adenocarcinoma. Nature 455, 1069–1075 (2008). Wood, L. D. etal. The genomic landscapesof human breast and colorectal cancers. Science 318, 1108–1113 (2007). The Cancer Genome Atlas Research Network. Comprehensive molecular characterization of clear cell renal cell carcinoma. Nature 499, 43–49 (2013). Downing, J. R. et al. The Pediatric Cancer Genome Project. Nature Genet. 44, 619–622 (2012).